Welcome to another Florida Bloggers Blog Hop, where we introduce you to all sorts of Florida-based blogs you might enjoy. Starting this week, and every week, we'll be featuring another Florida blogger, each one with new tips and info you can apply to where ever you live! Mary, a Central Florida blogger, runs this blog, which aims to help you save money. And with four kids and a husband, finding bargains can be important. I began my blog as a personal blog. It was a place to share my grocery savings each week. It used it to teach my friends and family how to coupon. I didn't intend for it to be public at first. Your blog is about coupons and deals. What made you choose that topic? I have always been a bargain shopper. I love finding deals and saving money on products, others to save money. My blog does a combination of both - I share the deals and I teach others how to coupon and bargain shop. Do you ever post any Florida-centric deals? How do you find them? Yes. I scour websites, local magazines, and newspapers for local deals and coupon codes to share. How has blogging helped you? Blogging has opened so many doors for me. I have been able to travel to places like California and New York on Media Events. I have met actors, musicians, and many wonderful bloggers all over the country. My blog is a pet blog. What are great ways to get deals for pets? Sign up for PetPerks with PetSmart to receive email updates on sales & deals on your favorite pet products. Keep an eye on your weekly coupon insert for great pet coupons to use. Publix has pet coupons that you can stack with manufacturer coupons found in the paper to help you save even more!! Want to get your blog noticed by a whole new group of readers? 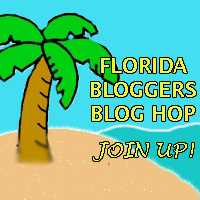 Join the Florida Bloggers Blog Hop! Enter the Blog Hop at the link on the bottom of this page. Fill out the handy form. Then, click on the link that says get the code at the bottom of your most recent post (which doesn't have to be about anything in particular, because we want people to see what it is you do regularly). Add that link, and then -- start hopping around the blogs on the Blog Hop list and meet your fellow Florida Bloggers. If you are using Wordpress.com, you need to do follow the instructions on the following handy picture I have added. That's it! So what are you waiting for! Join the Blog Hop! My mother is a mad coupon queen. People marvel at her skill. We love coupons!!! We love coupons almost as much as "buy one, get one"! Thanks for highlighting Couponers United. Thanks for stopping by, Oz! I like coupons! When I remember to use them. BOL!! I hear ya! I feel the same way. Mom keeps trying, and I fail her miserably. lol. At least I remember my Petco Pals rewards. Coupons are great!! My problem is mostly though time and keeping an overview. In fact, I have run to Target with coupons in my purse and then still totally forgot to use them :( That's why a web site like this though is really such a great idea, it makes your life much easier if someone else picks the best deals for you ;) Ad as little a the saving may seem sometimes: they all add up and it's totally worth it in the end! !